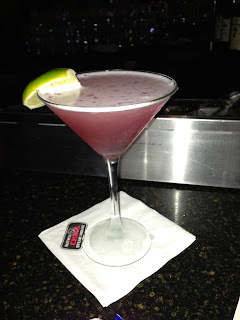 I was really excited to try Left Coast Kitchen & Cocktails since it has a whole "West Coast" vibe going on, with the chef and his wife having moved to New York from California and opening this restaurant to showcase California food and also because they couldn't find a great spot in their neighborhood (a dilemma my husband and I can understand). When you walk in, you immediately notice the creaky wood floors and the impressive old-school, speakeasy type bar to the left, manned by bearded, knowledgable bartenders. 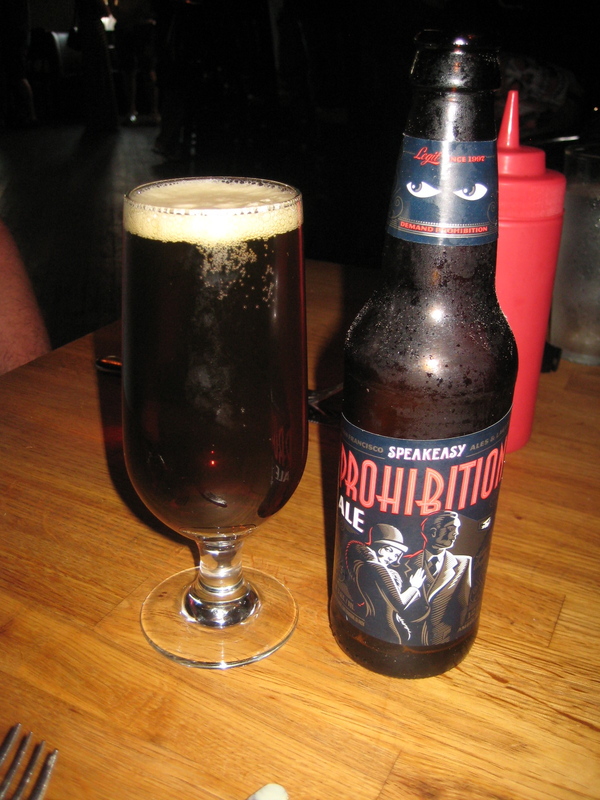 We sat at the bar to wait for our friend, and perused the extensive craft beer menu. They have an awesome beer selection - my husband started with the Old Crafty Hen, an English amber ale, and throughout the evening moved on to the Butternuts Pork Slap pale ale (yes, served in a can) and then the Speakeasy Prohibition Ale. He enjoyed all three. My friend and I each had a glass of the Wild Rock Elevation Sauvignon Blanc from New Zealand and it was bright and citrus-y, as are most NZ Sauvs! 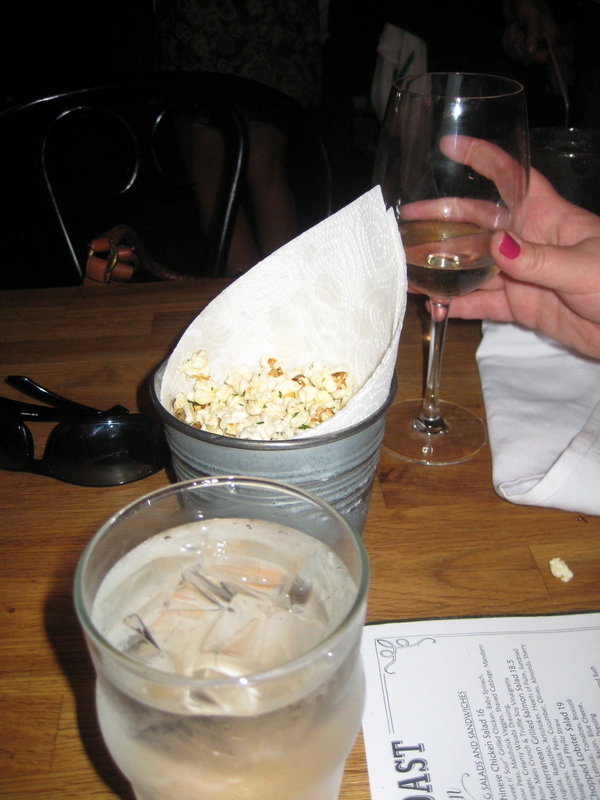 While you wait at the bar and when you sit down, they bring you homemade popcorn tossed in butter and herbs. It's great when it's fresh, but once it's been sitting for a while it gets soggy and greasy. Picnic Salad: Watermelon, heirloom tomatoes, arugula, pumpkin seeds, avocado ranch dressing and olive oil. We got the dressings on the side because my husband is a "ranch-hater," but I'm glad we did since I'm not sure I loved the idea of ranch dressing and watermelon. The salad was really fresh and juicy, thanks to the watermelon and huge chunks of heirloom tomatoes. At the back of the restaurant, there is a large window into the kitchen and on the shelf they had a huge platter of heirloom tomatoes - all different colors, shapes and sizes. I love that! Surf n' Turf n' Mac n' Cheese: Pasta shells tossed with white cheddar and truffle oil, with large shredded chunks of short rib, small bits of lobster, mushrooms, and bread crumbs. The dish was served in an adorable and colorful Le Creuset crock and was a very generous portion, as I noticed was a theme here with most menu items. The flavor was OK, and the short rib was plentiful. However, I hardly noticed any lobster and it was very dry and not very cheesy or saucy. And I was really missing that lobster. 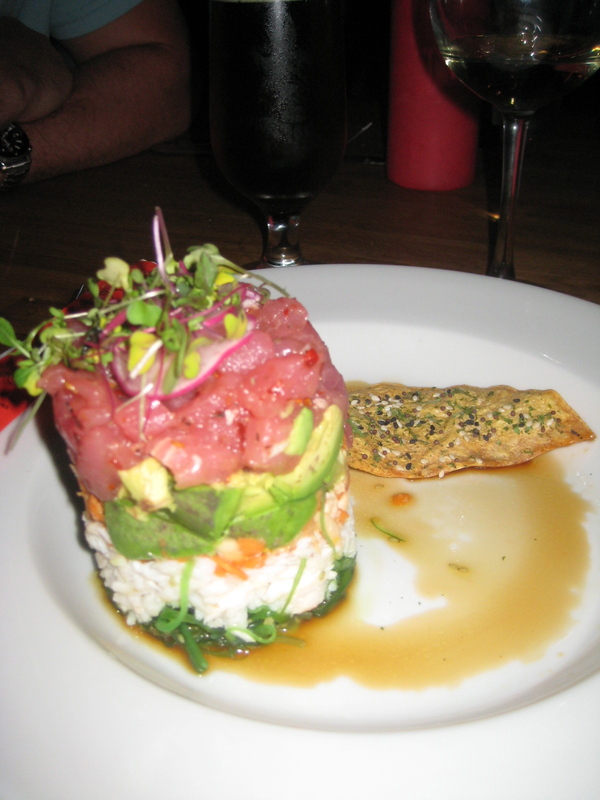 Hawaiian Style Yellowfin Tuna Poke: Beautifully presented in a layered cylinder and, again, was huge! The tuna was very fresh and high quality, but was extremely spicy without much other flavor to it. The bottom layer was seaweed salad, which was standard like at a sushi bar, the next layer was lump crab, avocado chunks on top of that, and the tuna on the top. I was really excited about the lump crab, but it was lacking in flavor as if it was not seasoned at all. Good crab shouldn't need much, so I'm wondering if they were just not using a high quality crab. There were also tropical fruits layered in there but they did not stand out much; perhaps more could have been used. I really wanted to like this dish since it incorporates some of my favorite foods, but I found it to be pretty bland. It could have benefitted from more seasoning and a lot more sauce, like a ponzu or even a wasabi cream of some sort. 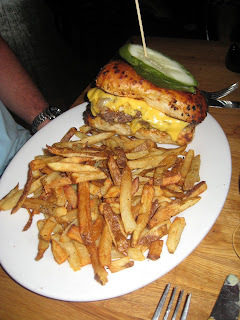 LCK Burger: This was essentially a GINORMOUS patty melt. It was served on a giant rectangular shaped onion roll, and consisted of two 4-ounce beef patties, topped with sauteed onions, melted cheese and bacon. We went without the slaw since my hubby hates anything with mayo. It was served with a huge portion of really good, fresh, probably double-fried french fries. Unfortunately, the burger left a lot to be desired. Despite ordering it medium, it came out completely well done without any pink at all. The roll and the patties were SO thick and dense, it was work just biting into it. The onion and melted cheese flavor was ok, but it was just too big and thick to really enjoy. My husband suspects they used Kraft singles for the cheese. And, the meat was overcooked so that made it feel even more dense. 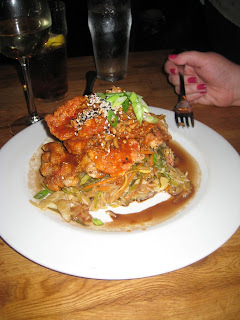 Shanghai Pecan Chicken: This looked pretty good when it came out of the kitchen, with the chicken being very crispy and coated in a bright red, sticky sauce. It was billed as a "sweet and spicy" glaze on the menu. However, when biting into the chicken, all you tasted was buffalo wing sauce! It was such a jarring flavor when you're expecting an Asian-style sweet and spicy flavor. We were very perplexed by this. I am told by my friend that the veggies and rice were both soggy. This dish was not a winner. Overall, we were not blown away by the food but really liked the bar atmosphere and the beer and wine selection. They also had some interesting cocktails I wouldn't mind trying. I think we will return, but will sit at the bar and have some drinks and maybe an appetizer or two. Unfortunately, this restaurant did not feature the best of California cuisine.